Viewer discretion advised as video contains strong language. 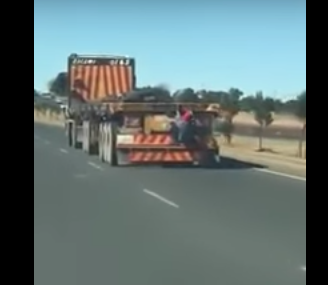 A motorist captured this video today, 25 May, of a man hitching a ride using a truck, reports Ridge Times. The unknown passenger was seen hanging on to the back of a truck travelling between Sky Hill and Secunda, Mpumalanga. He eventually let go at the traffic light by the entrance of Secunda. Henry Richards posted the video on Facebook, but said his friend, Josie, took the clip and asked that Richards post it.